Greetings! If you’ve been following along lately you’ll know that I have recently returned from a short Princess Cruise from Los Angeles to Vancouver, with one port of call in Victoria, British Columbia. Victoria had been on my bucket list for decades and ironically enough, I have now visited this charming city twice in the last 9 months. That’s because last August Brad and I took a cruise to Alaska that also stopped in Victoria. In fact, I selected that particular Alaska cruise primarily because Victoria was on the itinerary. 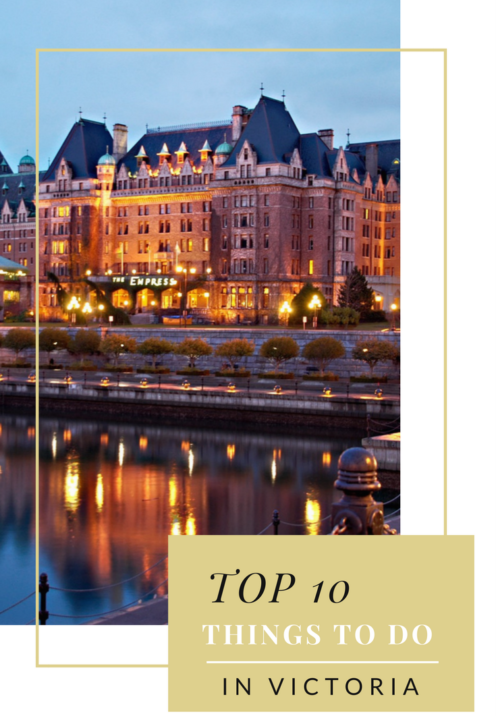 So, having now visited this charming city twice in less than a year, I feel somewhat qualified to share with you my Top 10 Things To Do In Victoria, BC. On our latest visit to Victoria the Town Cryer, as well as representatives from television & media were on hand to welcome the ship, as ours was the 1st cruise ship of 2017 to arrive in port. We felt very welcomed by the warm & friendly inhabitants of Canada’s oldest western city. Victoria is internationally renowned as the “City of Gardens” in large part because of the magnificent Butchart Gardens. Designated a National Historic Site of Canada , The Butchart Gardens receive more than a million visitors each year to what is one of the best floral-display gardens in the world. Victoria has the mildest climate in Canada so the gardens here bloom all year. For a comprehensive tour of this beautiful place read my Butchart Gardens blog post by clicking here. The gardens cover more than 55 acres of a former limestone quarry. While there I highly recommend partaking in a traditional British-Style Tea at The Dining Room restaurant. By the way, the Butchart Gardens are located about 14 miles north of Victoria proper. You’ll need to drive there by car, taxi or tour bus. CVSTours.com have buses that leave throughout the day from the Empress Hotel. An adult fare is about $47 and includes admission to the gardens. 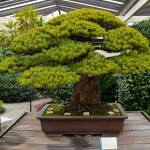 Visit The Butchart Gardens website by clicking here. When one thinks of Victoria it is likely the iconic Empress Hotel that comes to mind. Situated in the picturesque Inner Harbor, its location is a perfect vantage point from which to explore the waterfront and nearby Parliament Buildings. The gardens surrounding the hotel were in full bloom for our visit. The hotel is currently undergoing renovations which in my opinion are taking this classic yet timeless turn-of-the-century architectural masterpiece and giving the Grand Dame a very pleasing update. 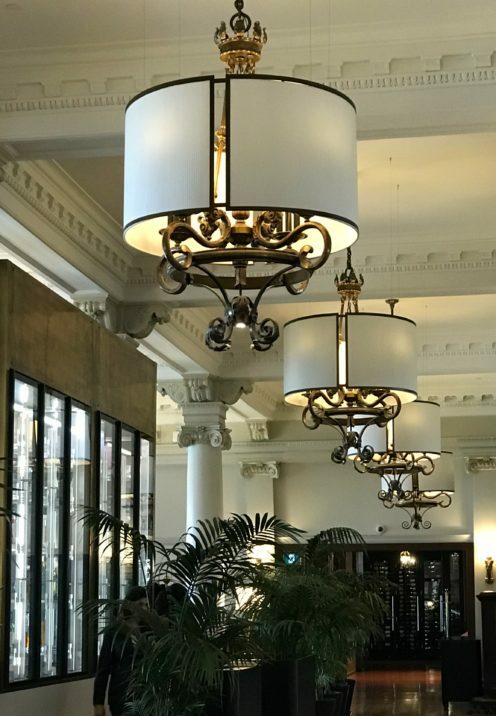 I really enjoyed the design, which takes the beautiful aspects of the old and ingeniously incorporates it into a modern and chic new ambiance. 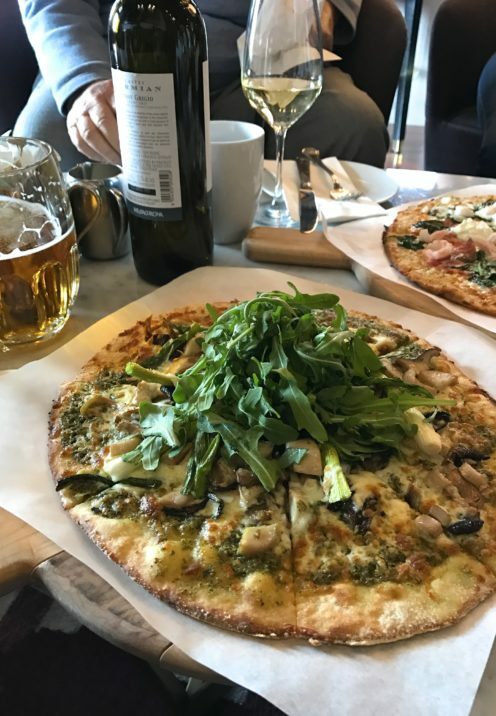 Tea at the Empress is a quintessentially Victoria experience but during our visit with 2 small children in tow, we opted for a casual lunch of delicious pizza in the Q Bar. I loved how giant photos of Queen Victoria were on display behind the bar, evocative of the recent PBS Masterpiece Mini Series, Victoria, that I recently enjoyed. Overlooking Victoria’s majestic Inner Harbor, the Parliament Buildings are open to the public year-round. 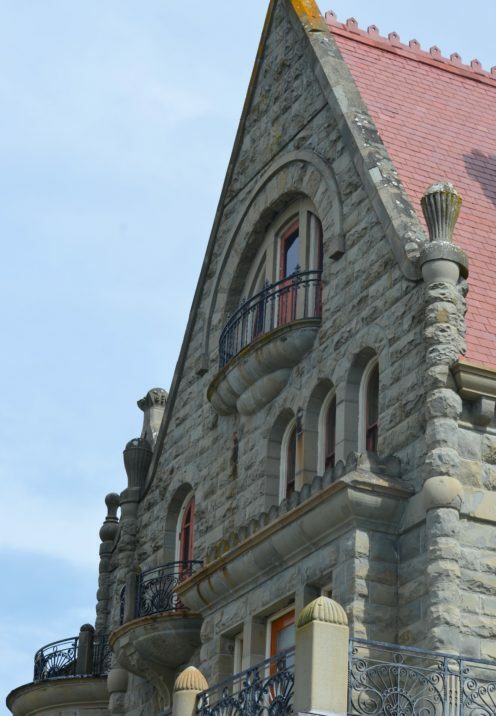 Visitors are invited to discover the architectural splendor of the buildings and learn about British Columbia’s Legislative Assembly. Parliament is open to the public from Monday thru Friday between the hours of 8:30 am and 5:00 pm. During the busy summer season, the Parliament Buildings are open for tours seven days a week, including holidays. Visitors are welcome to join one of the regularly-scheduled free guided tours, or to explore the buildings on their own self-guided tour. You might even consider sitting in on one of the Legislative Assembly debates. Then dine like a legislator in the Parliamentary Dining Room, open to the public year round for breakfast & dinner. Reservations are recommended for this elegant yet affordable restaurant. Also be sure to visit at night when Parliament House is illuminated by 3,560 lights. Security is tight and ID’s are required. For more information visit Parliament’s website here. 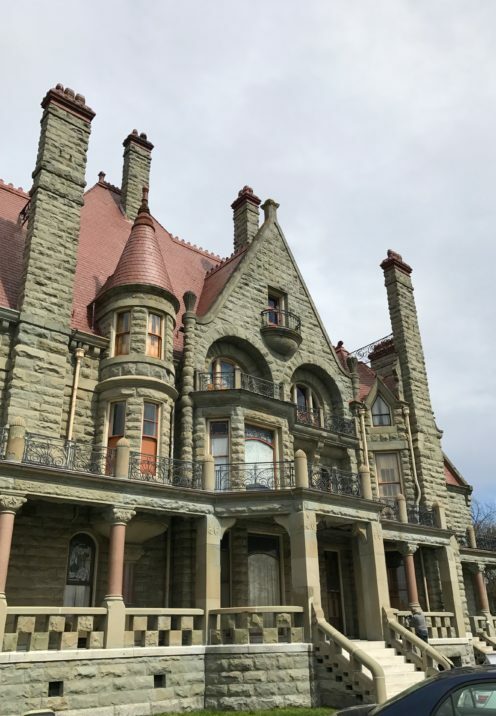 Craigdarroch Castle was built by Robert Dunsmuir, a Scottish immigrant who made his fortune from Vancouver Island coal. Known as Canada’s Castle, it was built on a hill overlooking the city of Victoria between 1887 & 1890 during the reign of Queen Victoria. The castle boasts 20,000 square feet of interior space and has 39 rooms that have been meticulously restored, giving visitors a glimpse of privileged life in the 1890s. Now a National Historic Site, the castle is open to the public year round. 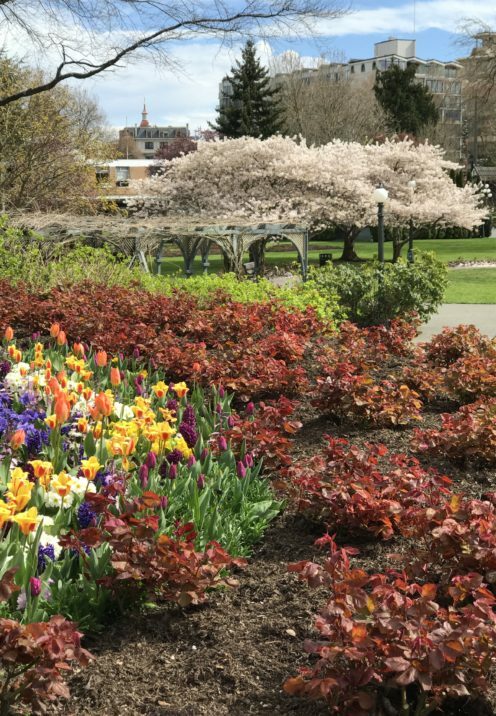 Beacon Hill Park is one of downtown Victoria’s crown jewels. 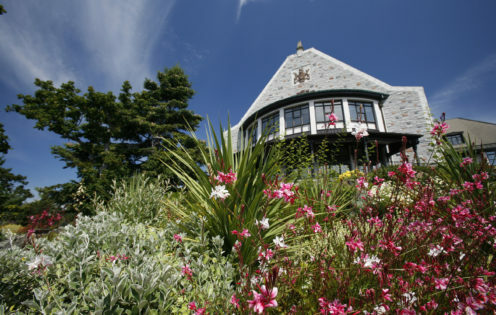 The 200 acre park is beautifully landscaped and adorned with bridges, lakes and ponds, and an alpine and rock garden. Horse-drawn carriages meander through the park and peacocks roam freely. A petting zoo gives kids the chance to experience farm animals up close and personal. 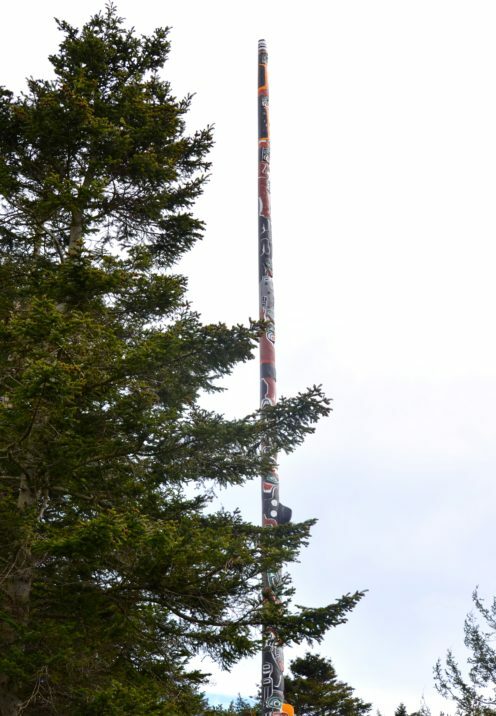 Also on display, one of the world’s tallest totem poles, standing 128 feet tall. 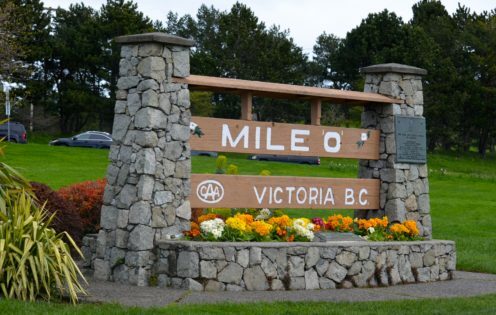 A roadside attraction, the Mile Zero Monument marks the beginning of the Trans Canada Highway and is located in Beacon Hill Park. 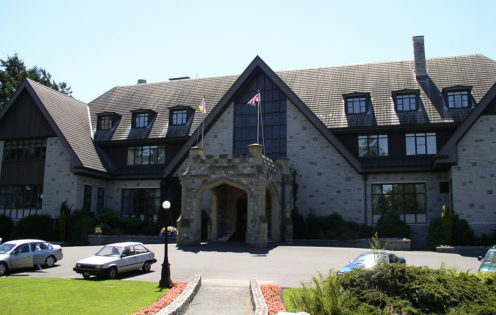 Government House is the office & official residence of the Lieutenant Governor of British Columbia. Originally known as Cary Castle, it is where members of the Canadian Royal Family and visiting foreign dignitaries are greeted and often stay while in Victoria. The grounds embrace 36 acres of lovely formal gardens which can be enjoyed by visitors. From May to September, the Cary Castle Mews Interpretive Center and Tea Room offers visitors a place to explore the history of this National Historic Site and enjoy a cup of tea as well. Public tours of Government House are offered one Saturday a month, at 9:30am and 11am. Tours are one hour in length. Visit www.ltgov.bc.ca for the next tour date. Just around the corner from Victoria’s Inner Harbor, Fisherman’s Wharf offers food kiosks, unique shops and eco-tour adventures in the heart of the working harbor. Wander down the docks with your lunch, buy seafood fresh off the boat, see moored pleasure vessels and float homes, and watch as fishing vessels unload their wares. You can also take a Ferry Harbor Tour or grab a Water Taxi at Fisherman’s Wharf. Visit Victoria Fisherman’s Wharf website by clicking here. 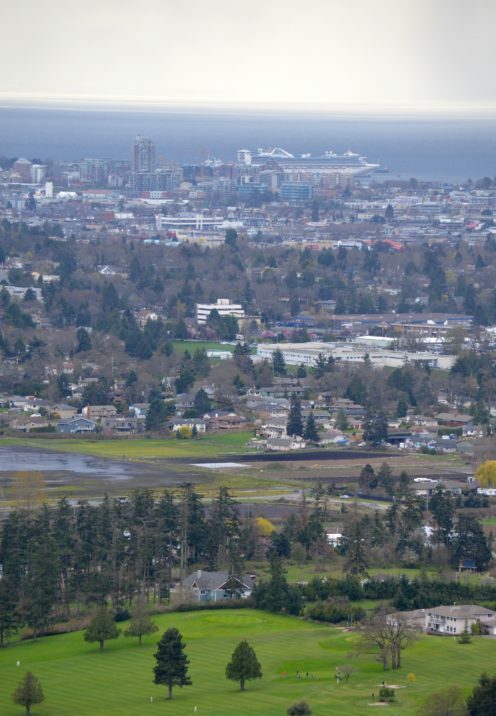 Mount Tolmie is easily accessible by car (some people choose to hike) and has a 360-degree view of Victoria from the top. 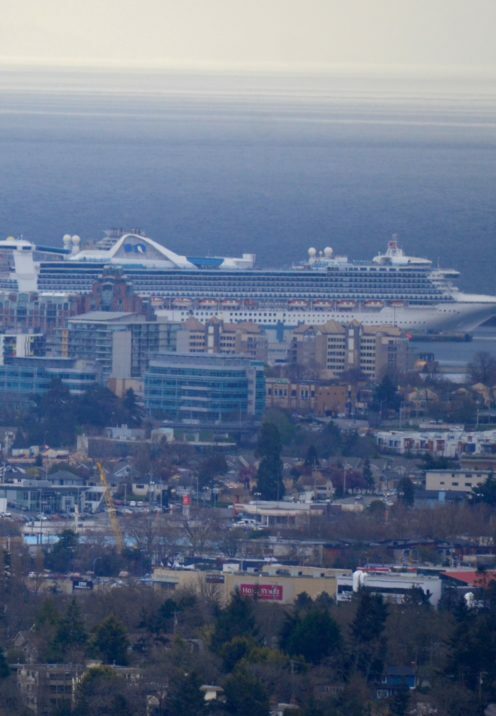 Widely recognized as “The Best Place to View the City”, the summit viewpoints provide an excellent panorama of greater Victoria and the surrounding region. We got a terrific view of our ship located just below in the harbor. There are miles of hiking trails through a lovely forest to enjoy at Mt. Tolmie Park. Canada’s oldest Chinatown, the 500-600 block of Fisgard Street, including the famously narrow Fan Tan Alley is a popular area for tourists. Fan Tan Alley is a very narrow lane, three to six feet wide and 240 feet long, that runs between Fisgard Street and Pandora Avenue. The narrowest street in Canada, it was once a popular location for opium factories. New brick structures were built to replace the defunct opium dens in the 1910s and 1920s, and the narrow space between the buildings became known as Fan Tan Alley because of the gambling clubs that operated there from the 1910s. Since gambling was not legal, police carried out raids on the alley. To protect the gamblers, wooden doors sealed the ends of the alley and watchmen decided whom to let in and out. The buildings also contained secret escape routes in case of raids. The Royal British Columbia Museum offers visitors a comprehensive look into the region’s history and culture, helping visitors broaden their understanding about the provence and British Columbia’s story. Exhibits include tribal artifacts from the First Nations (Aboriginal peoples of Canada), natural history displays and replicas of Colonial-era settlements. 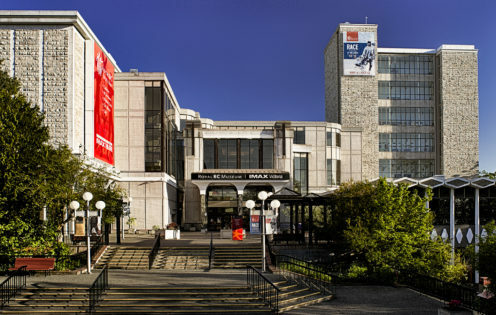 The museum also boasts an IMAX theater that makes you feel like you are really there. They also feature many rotating special exhibits. For a further look at Victoria, British Columbia and all it has to offer watch this video. Need help planning your trip or cruise to Victoria? Contact my friend & travel agent Lori and tell her I sent you! All opinions expressed in this post are my own. Thank you Tourism Victoria for several of the images seen here. Unless otherwise noted, all photos are the original property of Celia Becker @ www.AfterOrangeCounty.com and may not be reproduced without specific permission.